Vor vielen Jahren hatte ich mir in USA etliche Magazine über Folk Art gekauft, ich liebe Country Primitive und Tole Malerei und benutze diese auch gerne als Vorlagen. So hatte mir vor einiger Zeit mein Mann aus Holz den Hahn geschnitten und ich habe ihn dann bemalt und heute ist er fertig. Nun überlege ich wo ich ihn hinhänge oder stelle. Many many years ago, I got myself a couple of magazines with Tole Paintings and Country Primitives since I like painting like that also. One of the magazines gave me the Inspiration to do the hen. 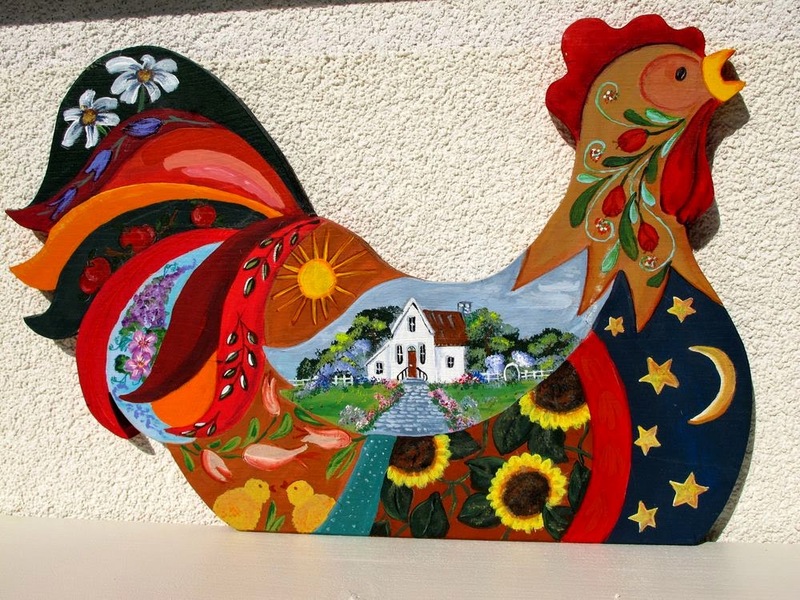 Detlef cut it out of a thick Piece of Wood and I started painting the Pictures on the hen. Today I finished it and now I gotta think about where to hang or stand it.